Kibbutz Sde* Eliyahu was founded in 1939 by German Youth Aliyah members. Back then, the Beit Shean Valley was full of malaria swamps and oppressively hot in summer (over 450 C in the shade). Instead of draining the swamps, the pioneers used the saline water to breed fish. Their drinking water came from the many (32) natural springs in the area. New immigrants from Italy, France and later also Holocaust survivors joined the small religious community. 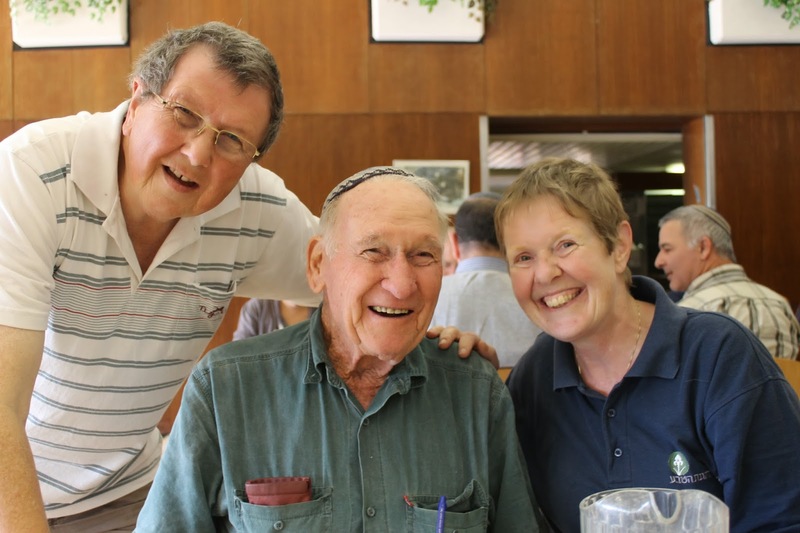 Today, Sde Eliyahu is only one of approximately 50 kibbutzim and Moshavim that still functions on the collective model - the rest are either partially or totally privatized. Three times a day, the 260 members (160 households, with an average of 5.5 children per family), take their meals in the communal dining room. Being the ‘heart’ of the community, ‘all roads lead to the dining room’. Believing that spiritual food is more important, the modern orthodox synagogue is built higher than the dining room. 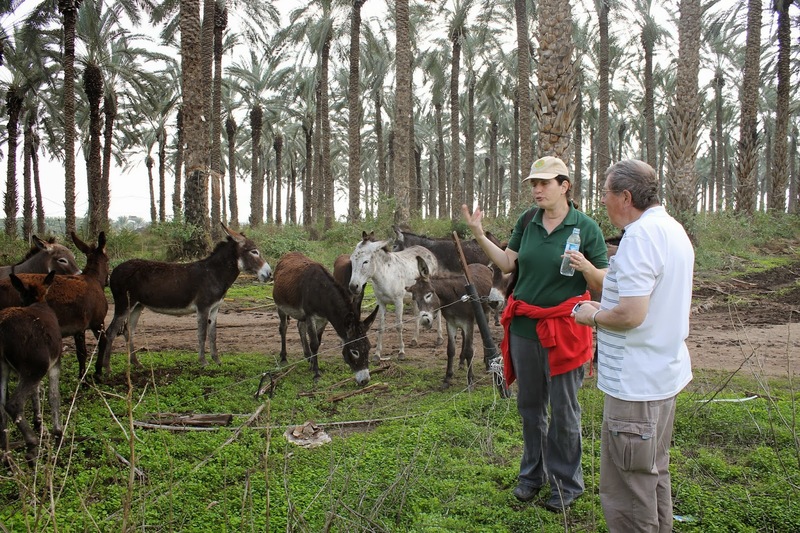 The kibbutz provides what the workers need - housing, food, clothing, medical care and education. The CEO of the factory and the girl washing dishes both receive the same allowance. Before joining the kibbutz in 1941, Mario Levy studied agriculture at the Mikveh Israel School near Holon. Upon arrival, the ‘expert’ was instantly put in charge of the field crops. Mario wanted to work the land and guard nature as the Lord created it (Genesis 2:15). He found it difficult to be forced to use the conventional methods of that time. Chemicals and poison destroyed nature and made people sick. In 1974, Mario became a pioneer in organic farming by creating a chemical free zone of vegetables around the kibbutz. After a long, uphill battle, eventually other farmers and the Ministry of agriculture realized that organic farming was the answer to the never ending cycle of stronger pesticides. Mario taught them to work with nature, instead of against it. Even weeds helped the farmer - not only by preventing evaporation, but often the bugs ate the weeds instead of the vegetables. Mario founded the Israel Organic Organization, which today supervises and certifies all Israeli organic produce. Certain rodents managed to damage 35% of the crops and in order to fight them, farmers were forced to use stronger poison. It didn’t solve the problem, and in addition affected the ground water, plant roots and killed migrating birds eating the rodents. Sde Eliyahu’s Shauli Aviel became the project leader of a bio-friendly way to win the war on rodents. 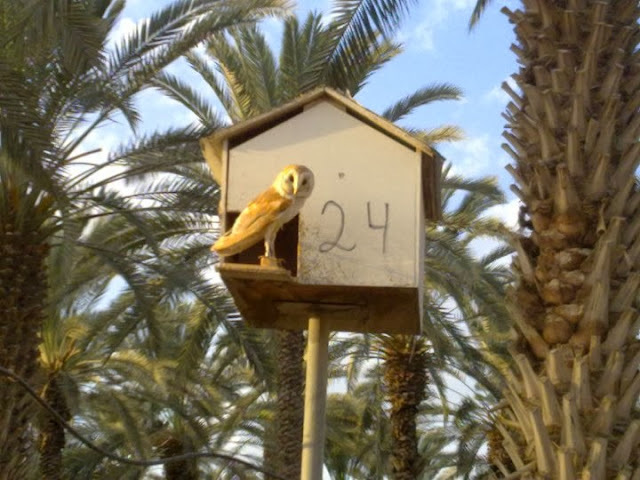 In 1983 he offered barn-owls 14 nesting boxes in the fields and nearby orchards. Research showed that one owl couple killed an average of 2,000 to 5,000 rodents (mice and rats) a year. Shauli also installed nesting boxes for the lesser kestrel. Both birds ensured a 24/7 solution to fight (and win) the war against rodents. This small project grew into a national and eventually regional project. Of the 3,000 nesting boxes across the country, 50 are in Sde Eliyahu. 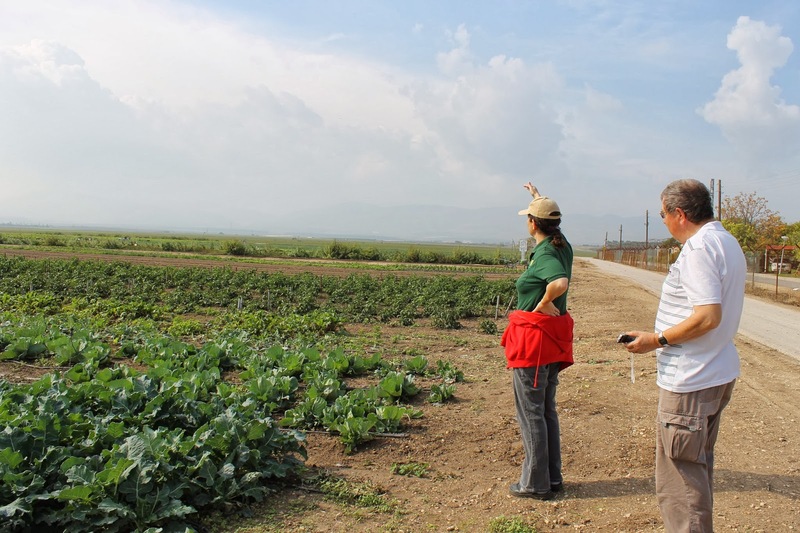 Together with Dr. Yossi Leshem from Tel Aviv University, Shauli launched a regional cooperation project between farmers from areas under Palestinian Area control and Jordanian farmers. Barn owl and lesser kestrel replaced the dove as ambassador of peace in the Middle East. Swarms of starlings damaged many a winter wheat crop, until a kibbutz member suggested to combat them with kites. This bird of prey was lured to the fields by a pile of chickenfeed. Its presence kept the starlings and sparrows away - another bio-friendly way to protect a crop. Sde Eliyahu is the only kibbutz that continues to makes a living from agriculture. Even their industry is related: Bio-Bee, Bio-Fly and SDA-Spice. Since 1983, Bio-Bee Biological Systems is a growing, unique company which mass produces natural enemies for biological pest control and bumblebees for natural pollination in greenhouses and open field crops. Bio-Bee staff consists of specialists in biology, entomology and plant protection. An earth bumblebee community consists of the founder queen, worker bees, pupae, larva and eggs. The queen can live for one year, but the worker bees usually die after 5-10 weeks. As most green house flowers lack nectar, sugar water and pollen are provided as food. Unlike honeybees, bumblebees are not aggressive, and don’t swarm. This makes it possible to work ‘alongside ‘people. Conditions deemed ‘unworkable’ for honeybees, such as clouds, wind, cold or drizzle, don’t bother the bumblebees. An established hive of 100-150 bumblebees is sold to the farmer who uses it during the pollination season. Ever since Israeli tomato growers began to use bumblebees for pollination, the yield of their crop increased by more than 25%. Today, all Israeli tomato farmer uses this method. Strawberries bearing the Bio-Tut sticker are pollinated by Bio-Bee bumblebees. Farmers using bees for pollination can no longer use pesticides; at least during the pollination season - they have to revert to biological pest control, which can also be bought through Bio-Bee. In 1973, Ya’akov, a (French) entomologist and kibbutz member, began researching and developing predatory and parasitic insects in the kibbutz bomb shelters. Today, different insects are mass produced in green houses and sold as biological pest control or IPM. Most organic farmers implement Integrated Pest Management (IPM). Some still use chemical fertilizer and/or weed killers, but switch to biological control the moment the fruit and vegetables appear. This pesticide reduced crop is more healthy and cheaper. Daughter company Bio-Fly (established in 2004) mass produces sterile males of the Medfly (Mediterranean Fruit fly) - a major regional pest. Using S.I.T. (Sterile Insect Technique) the males are released, mate with the female, who continue to lay eggs inside the fruit. However, because the eggs don’t develop, the fruit doesn’t rot. Used as another joint Israeli-Jordanian project in the Arava, both sides profit. Bio-Fly is the only privately owned S.I.T. company of the world - all S.I.T. projects are government owned. The I.A.E.A. (Atomic Agency) located in Vienna, Austria, assists companies worldwide. In the organic date orchards, nine varieties (of the 200) are grown. A herd of semi-wild donkeys keeps the weeds at bay. The founding members succeeded in growing the Seven Species mentioned in the Bible (except for the barley). For more than 40 years, these pioneers of organic farming continue to grow wheat, grapes, figs, pomegranates, olives and dates. We had the privilege to meet Mario in the dining room - such a lovely man! And 89 year old Mario continues to tend his organic vegetable plots on the fields of Eliyahu. *Sde (Hebrew) means ‘field’. Sde Eliyahu organizes Bio-Tours for individuals and groups in English, French and Hebrew - an amazing two-hour experience.